Grace wanted a quilt with bunnies on. This adorable pattern has long since disappeared. 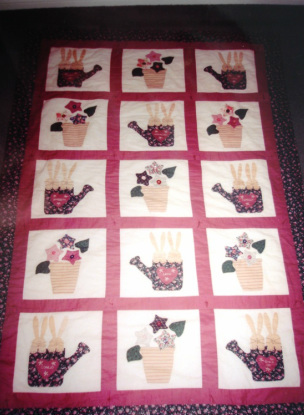 The bunny quilt was hand appliquéd as I sat waiting for the children to finish their piano lessons. Each heart has hello in a different language embroidered on. I try to keep a hand project on the go to fill those twenty minutes here or there that would otherwise be lost. Through the years several of my quilts have been (primarily) created with this reclaimed time.